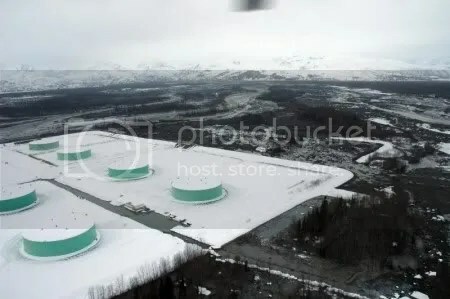 The Drift River Oil Terminal stands on Cook Inlet at the mouth of Drift River, about 40 kilometres (25 miles) from the vent of Redoubt Volcano. 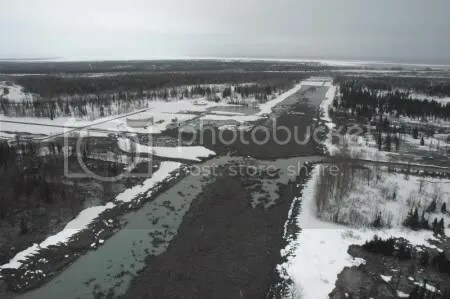 When there is eruptive activity of any magnitude at Redoubt, the melting of ice and snow produces lahars – volcanic mudflows – that descend the valley of the Drift River towards the inlet. Lahars reached the oil terminal during the eruptions of 22-23 March 2009. These pictures were taken during an Alaska Volcano Observatory overflight on 23 March 2009. The captions are those provided for each image by the AVO. More pictures can be found on the AVO website. Since these pictures were taken further eruptions have produced more lahars that have descended the Drift Valley. What effect these have had on the oil terminal is at present unknown. Awesome. Bill Burton showed these images last night at the Geological Society of Washington; great series. I love how the lahar juuuuuuuuuust dribbles over the edge of the berm! Video clip with audio eruptions/explosion of Redoubt volcano, occurred on 2009/03/26 at 16:24 and 17:24 UTC. Footage is from the official Hut webcam. Playing speed is 80x realtime, sound is obtained from converted digital seismic traces of REF, RDN, RDT, DFR, NCT seismic stations. Lahars, pyroclastic flows and steaming from heated snow can be seen. Towards the end of this video (about minute 3:40) weather conditions start to clear up and the summit of the volcano become partially visible, revealing a column of gray ash. Sound from RDN and REF stations has been denoised. For audio spatiality, each station (channel) has been placed respectively, from the left to the right, in this order: NCT, RDN, DFR, REF, RDT. This partially reproduces their actual physical location. I would be something to see a video of the lahars at their peak. By looking at the pictures on AVO’s website they must have been massive. 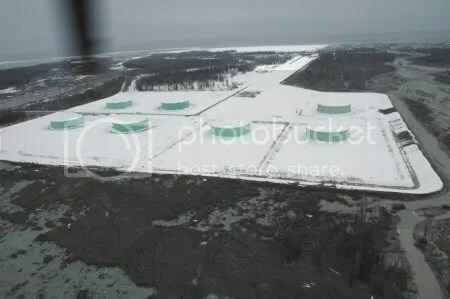 There’s probably some cameras at the Oil Terminal that would show something. Did not even think of that. Security Cameras are most likely every where there. Don’t know if anyone is checking this at night but those regular earthquakes are peaking at M1.5 every few minutes. That’s a lot of energy. Any ideas? Kind of looks like the dome building quakes on MSH a few years ago but much more energenic. 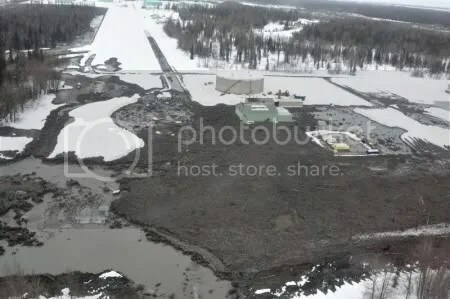 It’s still not clear that anyone has a response strategy to address a catastrophic spill from the Drift River Terminal. While we all certainly hope for the dikes to withstand any ensuing lahars, seems prudent to have a plan (unless in-situ burning is the end game). See http://www.inletkeeper.org for more info.